Last week was a busy week for Centrica. In addition to announcing the closure of its Rough gas storage facility, it also announced the sale of its two remaining CCGTs, confirming its transformation into a services-oriented company and the end of its previous strategy to be a leading owner and operator of large generation assets. The sale of the Langage and South Humber Bank power stations has been a long process, beginning in May 2014 when along with Killingholme, the divestiture was first mooted, with a price of £500 million being sought. The aging Killingholme plant was quickly excluded from the sale portfolio, and closed in March 2016. Early in 2015, final bids were received from a small number of interested parties, but these fell “significantly short of expectations”, so it is interesting to see last week that Czech utility Energetický a Průmyslový Holding (“EPH”) has agreed to buy the plants for a cash price of £318 million, subject to approval by EU competition authorities. EPH already owns the Lynemouth and Eggborough coal-fired power stations. The 420 MW Lynemouth plant is currently undergoing conversion to run on biomass and is expected to re-open in early 2018. The 1.8 GW Eggborough coal-fired power station remains open having secured capacity market contracts for the coming winter in the year-ahead (T-1) early auction in January. Eggborough’s operators have applied to the Planning Inspectorate for permission to build a new 2.5 GW CCTG next to the existing coal plant which would close before the new plant came into operation. A decision on whether the plant will receive a consent order is expected by October 2018. The move by EPH to acquire Centrica’s remaining CCGTs is interesting in two ways: firstly EPH is aggressively building its UK generation portfolio with a contrarian focus on large assets, and secondly, in reaching agreement on the sale price suggests that either Centrica has decided to accept a lower price than it wanted, or EPH is offering more than the 2015 bidders. Both are probably true to some degree. The original £500 million book value of the CCGTs was subsequently reduced in Centrica’s 2014 accounts in which the company recognised a pre-tax impairment of £371 million (post-tax charge £297 million) relating to Langage and Humber, and a pre-tax impairment charge of £164 million (post-tax charge £162 million) on its other UK gas-fired power stations. The £318 million offer from EPH appears to be significantly above the current carrying value of the assets. In its 2016 accounts Centrica reported a material recovery in its generation margins at Langage and Humber with volumes 65% higher in 2016 than in 2015, driven by improved plant reliability and power market tightness in the second half of the year. Summer 2016 saw a sudden improvement in clean spark spreads both in the spot and forward markets, returning to levels not seen in several years. The doubling of the UK’s carbon price floor from £9 to £18 / tCO2 in April 2015 has been a key driver of coal to gas switching in the GB power market, driving coal out of the merit order ahead of the planned coal retirement dates announced by the government. – Paul Verrill, director of EnAppSys. Although the change in the CPF was clearly not a surprise to the market and was known by the original bidders for the Centrica CCGTs, the market does seem to have been taken by surprise by the pace with which coal capacity has been exiting the market – 4.2 GW of coal generation exited the market in 2015/16 and both Eggborough and Fiddler’s Ferry announced closures which were then reversed or delayed due to securing capacity or ancillary services contracts. 1 The capacity of the plant was reduced to 370 MW in 2014 following a fire. 2 The plant closed in December 2015 for conversion to biomass and expects to re-open in early 2018. Market dynamics currently favour existing gas plant. 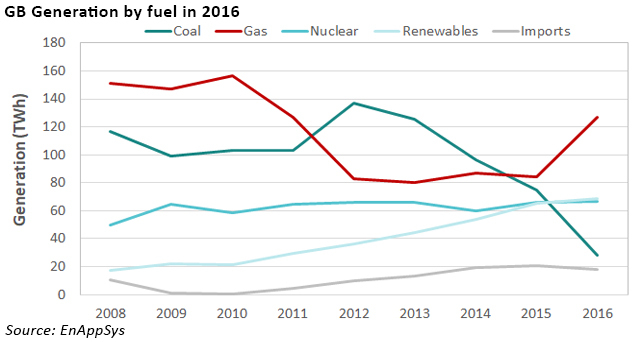 With no large new CCGTs coming forward through the capacity market, and the renewables trend continuing, the future for gas-fired generation looks more positive than it has done for some time. Whether the price paid by EPH will be justified remains to be seen, but its not a surprise to see deals being done. ← What does the closure of Rough storage mean?